I don’t have any new photos to put up at the moment, so thought I’d write about one of my favorite authors right now. Stieg Larsson. You may have heard of The Girl with the Dragon Tattoo? I read that and the second one, The Girl Who Played with Fire. I just bought The Girl Who Kicked the Hornet’s Nest, but am loath to begin it. Why? Because I don’t want the series to end. This guy is the most amazing storyteller! He draws you in and never lets go. Lisbeth Salander is one helluva protagonist. It’s refreshing to encounter a female character who’s so strong and drawn by a male writer. You can sense his admiration on every page. Supposedly, Larsson left part of a fourth novel on a computer in his partner’s possession. The partner, Eva Gabrielsson, inherited nothing from the millions of books sold because she and Larsson were unmarried. I guess you have to publish your address to wed in Sweden, and they needed to guard their identities because of the death threats! Could you just weep? Hopefully the fourth book will make its way to publication. For now, I’ll savor every page of number three. I should issue a warning here, though. These books are NOT for the faint-hearted! There are some really terrible characters in the series who do unspeakable things. Usually I can’t handle stuff like that, but Larsson makes it bearable somehow. One more thing: go see the Dragon Tattoo movie–it’s excellent! I’ve only seen a few Swedish movies, but liked them all. I loved that this film didn’t have the “Hollywood treatment” where everyone looks perfect and youthful and plastic. The main character has bad skin and wrinkles and not-so-great hair. But he’s so much more believable that way. And the women look–gasp–their ages! Hollywood, please take note. I’m off to shoot photos…have a great one! 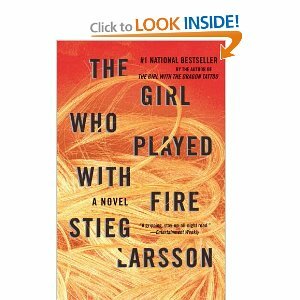 This entry was posted in books, literature and tagged Millennium Trilogy, Stieg Larsson. Bookmark the permalink. I didn’t know there were 10 books planned for this series! That fact makes me even sadder that there will only be 3, possibly 4, books published ever. I love this series as well and wish I was as badass as Salander. And I saw the Swedish version of the film, too. It’s probably one of the very few book-to-movie adaptations that I liked. Definitely refreshing to not have that “Hollywood perfection” take away from the harshness and reality of the movie. I just finished the first book, and it was great! I’m excited for the movie, too. I’m taking a break before I continue reading the series because like you said, there are some really harsh parts. I didn’t know the part about his partner and death threats. Awful! I agree with you completely! I don’t want to start the 3rd book either. But you’ve given me hope with the 4th manuscript. I love these books and have yet to see the movie. Books turned into movies alway disappoint me! Thanks for making my day! I saw this on the front page and HAD to stop by! This too is one of my favorite series and I was so sad that he died. I finished the last one just a couple of weeks ago. A lot of people that I know say they can’t get through the first book. I try to tell them that it gets better. My friend read the first book, and she immediately passed it along to me…I’ve been hooked since. I’m saving book three for my vacation read. Can’t wait! I hope you enjoy it as well! I love these books, and I flew thru the first two and for the same reason, the third is slow going…. not because it’s bad, but because when it’s done it’s the end. I have really been enjoying this series too! It is so sad about Larson’s death. I am in the middle of the second book and I entirely agree with you. I just love Lisbeth! I am waiting to see the movie until I am all done with all three books since I really do not want to meddle with my picture of her. The Girl with the Dragon Tattoo is the next book on my “to read” list. I work in a library and have had countless patrons reccommend it to me. I hope it lives up to my expectations. I just devoured the first book last week while laid up sick on the couch. I started the second and am enjoying it even more than the first…one thing, for me, is that the translation from Swedish to English seems a bit…stilted. I wish the language had more of a free flow. Too bad I don’t read Swedish, so I could understand his “voice” better. and, truly, some hard, graphic material is covered. Yes, that’s my only complaint too. I found myself saying, “Oh, that’s just not the right word in English” more than once. But I think his storytelling made up for it. agreed! can’t wait to continue on in the series. You picked a good series! The good thing about reading Hornet’s Nest is that it’s so satisfying, and the second you finish it, you want to re-read the series again. No more Larsson books (well, for now- we’ll see if the much talked of 4th book on the laptop appears). In the meantime, you might try Jo Nesbo. Thank you. I’m always looking for good books. Thanks for the post on this series. I knew nothing of the authors death and the way you make the series hard to put down has moved it up on my summer reading list! oh my goodness, i didn’t know that he was dead, he is one of my favorite author’s too! i JUST started reading his books, i have all three because of the first one. That’s incredibly saddening….i wish i hadn’t started now, he seems like he was a hero for the world, one we didn’t know about until his death. I do hope he comes out with more books, the final one, as you said, and also maybe a biography, i would like to know more about him. I could just kill those people making death threats, the guy wasn’t evil, why do they do this to good people? But i guess it has always been the war of the world when you are an author, because words are so powerful. Thank you for your post, it has really caught me. Interesting line: I could just kill those people making death threats. A book recomendation since you like mysteries: Await Your Reply by Daniel Chaon. Suspenseful from beginning to end. My mom is sending me all three of these books in the mail. She said the exact same thing you said about not wanting to read the third book because she knew the series would end after that! I am so excited to read these books! I have read several reviews and have heard nothing but good things. I normally don’t read fiction, so this should be interesting! I loved the whole series and I can only hope that someone can finish/edit his fourth book…I wish he were still around to write more great stories. I’m really looking forward to these! I hadn’t heard that he meant to write 10, though. That’s so awful that he died so young. I didn’t know the author died. That is sad. I haven’t been able to read these yet, but i am going to. Your post reminded me I need to read this series. I bought the first book (finally) at the bookstore. I’m having some trouble getting hooked, but I’m only on the 3rd or fourth page. I put it down to read another book, but I’ll go back to it tonight. Millions of people can’t be wrong. Right?? amazing trilogy – so sad it will never be complete. There are loads of loose ends, which would’ve been brilliant for future books. I have finished all three, and I wept at the end of the third, because I have come to truly love the characters in these books, and I do not want them to go out of my life. I can’t wait for a fourth book. And I plan to see the film. By the way, Hollywood has purchased rights to these novels, so there will be a slick, probably-not-as-good movie version in the next year or so. . . I too love these books and I secretly enjoyed reading when they mentioned IKEA in them! While I liked the series, I did not like the third book as much as the first two but it was still a great book. 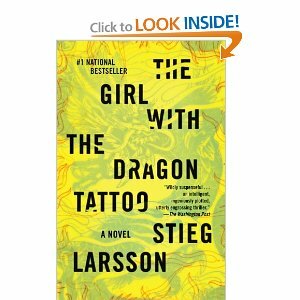 I also enjoyed the Lisbeth Salander trilogy, but we may both have a long wait for the fourth book to be published. Larsson’s partner and his estranged blood family have been at loggerheads over who actually has rights to his work. His partner’s inheritance rights were undermined because she and Larsson never married. Apparently he thought this was safer for her whilst he was under threat from the right-wing gangs. I have not seen either film version of the first book yet. They’re on my list. I couldn’t agree more, these books are so gripping. I love the characters. I was so worried that there would be a let down in the quality from the first book to the second, but it was instantly engaging. I also agree on the movies. Did you see the Vanishing? the ultimate creepy movie in the original Swedish version, became somewhat tepid when Keifer Sutherland and Hollywood did the remake. Nice post. I heard the original Vanishing was really frightening, so had to pass. I can’t take scary movies! Thanks for this post. I just started reading the first book. I can’t put it down. Interesting to read about the author. I read he had passed away at a young age. I know the feeling you have when you don’t want a book or series to end. This makes me want to read the series now! I’ve only read the first one but loved it! I just ordered the second from the library and the movie from Netflix. unfortunately i just couldn’t get into the book… the writing style just wasn’t my cup of tea… a lot of people i know like it though. I finished the first and have started the second. Totally addictive. A tragedy that Larsson died before seeing the books published. This caught my eye because I am just starting the first book in the series. Now I cannot wait to have some time to relax and read it! I just started reading the first book and it’s so AMAZING! I can’t wait to read the other two! I got excited when I found out that the fourth book might be published! I never like watching the movie of the book ive already read, it disappoints me. But Noomi Rapace is amazing in playing Lisbeth Salander! It’s shame to hear, however, that the series was cut short; it’s a bit like your favorite show being canceled after only one season, and without the main storylines wrapped up (Firefly springs to mind, but Studio 60 was another great one gone before it’s time). Thanks for the recommendation. You may have created a new fan! Believe it or not, I went to the wordpress front page tonight for a class that I’m required to start a blog for. 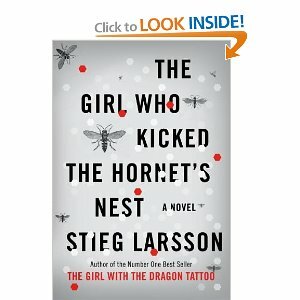 The first thing that popped out was your blog because just tonight I bought The Girl With the Dragon Tattoo. Not because I had heard of it or Larsson, but because I stumbled upon The Girl Who Kicked the Hornet’s Nest in Borders tonight, read the jacket, thought it looked good, and decided to start reading the series. I’m not usually a Mystery/Thriller reader, but the story line just seemed rather interesting. I’m glad I came upon your post, though, because I had no idea of the “drama” behind the series. I have to say that I’m rather disappointed that I won’t get to read the entire planned series and I haven’t even opened the first book yet. Thank you for the insight into the series and its author! I absolutely loved the first one, but haven’t gotten around to the next two yet. I didn’t realize that he had planned on 10 – such a shame. I have to say I’m one of the few people in America that read the series even before the third book was out. To think his dad and brother, who did not support him while alive are now going to enjoy his money while his dead. Too sad! I have written about Lisbeth and about Stieg, like two or three times on my blog. I just can’t stop compering things to her or the series. I’m heart broken that we will never get to read another book by him…ever!!!! I just finished reading The Girl with the Dragon Tattoo. I couldn’t put it down. I can’t wait to read the other 2 books in the series. There is a Swedish movie based on the first book; and it is also in production in English. I absolutely loved the movie. The cinema had the first two books on sale so I bought both. I haven’t started them, I’m too busy and stressed to enjoy them. I didn’t know there were 10 books planned, now I’m kind of bummed that I’ll only get to read three, possibly four. you make me want to read this book. but still not sold in Thailand, i think. i will try to find out. You can probably find it on line at amazon.com or barnesandnoble.com. Amazon also has a Canadian site. Hope this helps…. Hey, Congrats on being Freshly Pressed! Thanks for the book review . . .love to read and haven’t read that series yet. Now I can’t wait to run out and get all three. Sorry to hear about the authors death & the too soon end of the series. Concerning politics: Larsson was not so much a figher against racism and whatnot, as he was himself a leftist extremist. This includes being a member of or associated with several communistic/socialistic organisations of disputable “kosherness”. I have even heard claimed, but do not vouch for this claim, that he was at a time involved with training Eritrean guerilla soldiers. Generally, Sweden has a severe problem in that those who in anyway criticize the current immigration policies or question ideologically determined PC “truths” are immediately branded as racist or extreme right—irrespective of whether they are. (Some are; some, likely most, are not.) See for instance an article of mine on the treatment of Sverigedemokraterna—a treatment which includes physical violence, death threats, and similar, from leftist extremists. Larsson was on the left, for sure, as he was entitled to be. But I have never heard that he was involved in any violent left wing gangs. It’s a big jump from labeling him as socialist (which is not such a big deal in Europe) or even communist, to suggesting he was involved in violence in Sweden. What is true is that it is often (though not exclusively) people on the left who oppose racism most vigorously – for instance the South African Communist Party. Doesn’t mean the lefties are great in every way, but anti-racism tends to be one of their more appealing sides. To avoid misunderstandings: I did not mean to imply that Larsson had been involved in the violence cases mentioned at the end. There I merely point to a general problem (which, obviously, goes back to a small minority). As an aside, I do not consider socialists and communists to automatically be “evil”. There are considerably differences in degrees. Larsson, however, was a member of a party which was in the revolutionary category. Extremists of anything do tend to be dangers. I’ve read the trilogy and was thoroughly thrilled with each and every book! I am glad his novels are gaining the recognition he deserves! “The girl with the dragon tattoo”? I like the Swedish title a lot more, which translates to “Men who hate women” – a much more provocative and interesting title, in my opinion! They may have wanted to avoid confusion with “Men Who Hate Women (and the Women Who Love Them,” a bestseller in nonfiction years ago. Have all three been made into movies? Oh, that’s good news. I didn’t know that 10 books were planned, that a a 4th one is out there (even if only partially) and that his death was suspect. What a shame!!! I love these books with a passion! Congrats on getting chosen for freshly pressed! Thank you. Believe me, the freshly pressed thing was a total shock. I finally decide to make this mostly a photography blog and then my post about books gets all the attention. Story of my life! I hope I haven’t upset too many people with the info about Stieg Larsson. I’m kind of fascinated by the lives of authors whose books I love. I want to know what influenced them, what motivated them, how much is autobiographical, etc. For me, the reading experience is made richer by all that. Before I forget: The “his death may have been suspicious (a heart attack at 50)” part took me by surprise. I have not followed the aftermath of his death in any detail (mostly speculations about whether he actually wrote the books himself and fights about who should inherit what—and mostly on the gutter-press level), but I have never heard this before. Wow, I hope it was an exaggeration! These books were absolutely amazing. I found his writing intensely captivating. I agree it’s not for the fair hearted… WARNING! There are some very developed characters I would love to just punch in the face! I shall look for the movie on DVD.